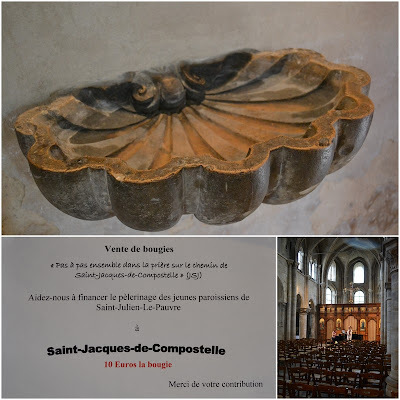 For many people a trip to Paris is a kind of modern-day pilgrimage, but for several hundred years the city has also been one of the traditional starting points on the Chemin de Saint Jacques (Way of Saint James) pilgrimage to Santiago de Compostela in Spain. Although many pilgrims come from further north, stopping perhaps at the Basilica of Saint Denis and the Saint-Jacques-Saint-Christophe church alongside the basin de la Villette, the traditional starting point for pilgrimages from Paris was the Saint-Jacques-de-la-Boucherie church, of which only the tour Saint-Jacques remains. The rest of the church was taken apart after the French revolution, with the individual stones sold off and used for other constructions. It is ironic that a building that stands now almost as a monument to the French secular society should still be the starting point of religious pilgrimage. That said, many of the 'pilgrims' who follow the route today do so for their own metaphorical reasons, or just for the pleasure of walking. From this point it is around 2,000km to Santiago de Compostela, a distance that serious walkers can expect to cover in around six to seven weeks. My walk to just beyond the city limits would take around two hours. Setting off from the Tour Saint Jacques in Chatelet, the first stop is just across the river, at the Saint Julien le Pauvre church. ﻿Outside, the oldest tree in Paris. Inside, my first scallop, a holy water font, just inside the entrance. The church is something of a mongrel. It is one of the oldest remaining religious sites in the city, but the building is made up of mismatched bits added or altered throughout its history. Like Saint-Jacques-de-la-Boucherie, it was listed for demolition during the revolution then forgotten about before being given over to the city's Melkite community at the end of the 19th century. As is the case with the majority of churches in Paris, this one was almost entirely empty. A couple of musicians were setting up their equipment for a concert that would take place later that evening (the only time when the churches are full), and provided an interesting sonic soundscape to the visit. On the noticeboard, a message encouraging me to purchase a candle for 10 Euros, with the money going - appropriately enough - towards a future pilgrimage of young parishioners to Santiago de Compostela. The route towards Santiago de Compostela from Paris most clearly begins on the significantly-named Rue Saint Jacques. Dating back to roman times, it is perhaps the oldest road in Paris - and was also one of the busiest until Haussmann hacked out the much larger and noisier Boulevard Saint Michel alongside. A few steps away from Rue Saint Jacques is the Musée de Cluny. This medieval mansion house, originally the residence of the Bishops of Cluny in Paris, is in flamboyant gothic style, and a gaudy demonstration of wealth. Although the house was not on the pilgrim's route, the influential bishops of Cluny played a key role in the mapping of the various paths, and it is perhaps for this reason that exterior walls of the house are covered in scallops. Interestingly, 19th century pictures show a house without these shells, suggesting that they were a much later addition (after the house had become a museum), a kind of fake gothic ornamentation to attract gullible pilgrims passing by. Further along the Rue Saint Jacques, just beyond the Pantheon, a sign high up on the wall of a building, tells us that we are passing through the old Porte Saint Jacques, one of the entrances into Philippe Auguste's walled city. A few hundred metres to the south is the next significant site, Saint Jacques du Haut Pas. On the wall outside, another scallop symbol, this time confirming that the church stands on the Chemin de Saint Jacques. 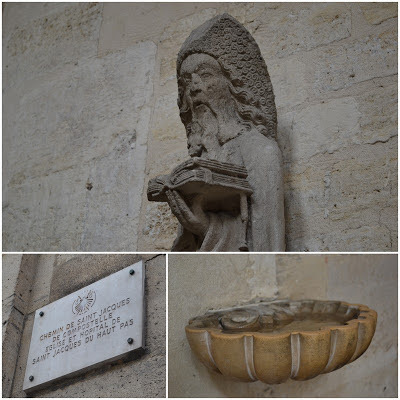 Inside the church, which was originally built in the 12th century on land belonging to an order of monks from Altopascio (Haut Pas) in Italy, there is another scallop holy water font. I also meet Saint Jacques/James himself for the first time. The diminutive statue dates from the 14th century, his face and hands eaten away by time, but there is surprising power in his delicately carved features. Inside the church I spot a man with a backpack, walking boots and cut-off denim shorts, the only person I see that day that matches my idea of a pilgrim. As I leave the church I spot him again, striding purposefully in the direction of Santiago de Compostela. I'm disappointed not to find any shops selling tacky trinkets (or scallop shells), cashing in on their position along the route in Paris, but it's probably too early in the trip for that. However, I do though see scallops on the menu of several restaurants. Near the Val de Grace hospital, I find a real scallop shell, stuck somehow to a concrete wall. Quite high up (I need to stand on a wall to photograph it, drawing strange looks from passers by) it also blends in to its background, making it difficult to spot. As a route marker for pilgrims, it seems rather clandestine. On the other side of the road, at the entrance to the hospital's chapel, a giant scallop shell fans out behind the head of a statue. As I approach the edge of the city the significant sites start to thin out. The Rue Saint Jacques becomes the Rue du Faubourg Saint Jacques, informing us that we are moving away from Paris. To the left, the high walls of the Santé prison then the Saint Jacques Metro station, both situated almost exactly at the point where the pilgrimage route cuts across the Paris meridian. As Saint Jacques becomes the Rue de la Tombe Issoire, the path becomes less clear. There are no scallop markers plotting the route, so I continue walking in a straight line. After passing by the giant - but hidden - reservoir de la Vanne, I see that this decision was a mistake. Somewhat incredibly, the path seems to lead straight onto the périphérique motorway. The final stretch of road is a non-space, a collection of trees and bushes beside the Cité Universitaire, housing a small tent city of the homeless. The street seems to serve no purpose, beyond acting as a shortcut known only to taxi drivers. On the other side of the périphérique I can see that the road continues in a straight line. Was the centuries old pilgrim's path redirected when the motorway was built? Although churches have stood on this spot since the 13th century, this impressive concrete box dates from the 1930s. Designed by the architect Eric Bagge, it was built with the assistance of the engineer Eugène Freyssinet, and is very reminiscent of his industrial hangars. If the building looks like it is missing something, this is because construction was interrupted by the war. A spire was planned, but finally never added. 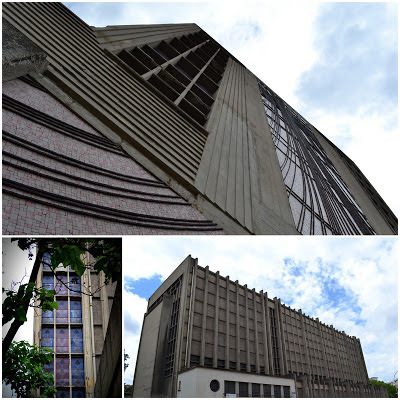 The building is in quite poor condition today, and was apparently closed (for the afternoon? The day? For repairs? ), but I was happy nevertheless to spot a series of scallops in the stained-glass windows. My trip finished here, as has many other people's over the last hundred years or so. In 1885, the bishop of Paris declared that this church (in its previous conception) was one of three in the Paris region that people could make a pilgrimage to if they were not capable of walking all the way to Santiago de Compostela. Today that's good enough for me. My walk covered around 5 kilometres. From here it would be just another 1,995km to Santiago de Compostela, but instead we'll take a leap of over 500km and pick up the path again in Le Bouscat, just to the north of Bordeaux. Part Two: Invisible Bordeaux then picks up the trail again as it winds its way through the city of Bordeaux. Not due to faith, but just for the pleasure of it, I often dreamt of doing it all the way to Santiago. So far, I have cheated by doing a few miles here and there in France and in Spain... but never reached the final destination. I was not familiar with 'situationism', but now that I have looked it up, I am not sure what it has to do with a 'pilgrimage' or what you mean by psychogeography. Anonymous: what I was interested in here was the significance of a centuries old pathway through the city which is 'invisible' to the non-initiated. If we take one of the most commonly used descriptions of psychogeography, penned by the Situationist Guy Debord, it is "the study of the precise laws and specific effects of the geographical environment, consciously organised or not, on the emotions and behavior of individuals", it seems it could have much to do with pilgrimages (or at least the routes they have traced). A pilgrimage is a walk along defined routes to a specific destination, and by definition something with great emotional significance. It was not my desire to follow the path all the way to Santiago de Compostela, but rather to see how it has affected to (psycho)geography of Paris. 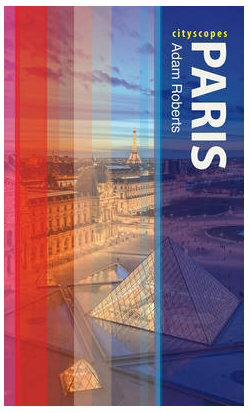 I find it fascinating that one of the principal routes through Paris exists only because it was (is) a pilgrims' path. That said, I'm not sure what the Situationists thought of the act of making a pilgrimage, nor if any psychogeographical texts on this theme exist. Wonderful post. We once rented an apartment on the rue du faubourg St-Jacques and walked into the Latin Quarter and back many times, but without noticing the scallops. Bravo. I was always fascinated by the name "rue de la Tombe Issoire." Whose tomb? Is there any connection with the pilgrimage route? Philippa: According to city records, the name relates to the tomb of a giant named Issoire, who was beheaded by a French aristocrat and buried near the point where the road begins. All this was before pilgrimages began on this route, but may have been one of the legends they told each other. As this story is unlikely to be a true one, it is thought more probable that the name relates to a family called 'Isoire' who lived nearby in the middle ages. 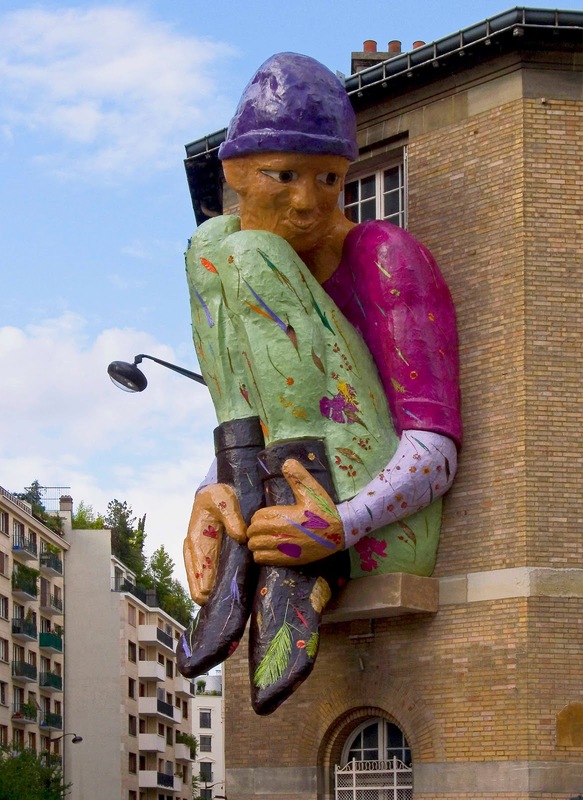 The giant did reappear on the street a few years ago though - on the front of a school (with head)! Well, this is what I call real contemporary psychogeography. I am so pleased to see this happening. Thank you for sharing. BTW. I visited this summer the world oldest planted tree in the urban area [you again mentioned it in this blog post]. Thanks friends of the Way of Saint James. The project http://www.rutacaminosantiago.com, is a merger between the passion for the Way of Saint James and love of old maps, all together to create a product that allows immortalize the experience of the way through a custom map with antique style. Best Regards and BUEN CAMINO!! The Paris Archives: A Lucky Find?